Sony took the official wraps off of the Xperia S Tablet at a press conference at IFA 2012 today. Images of an unknown quad-core Sony tablet have been floating around since earlier this month, and now we have all of the details. 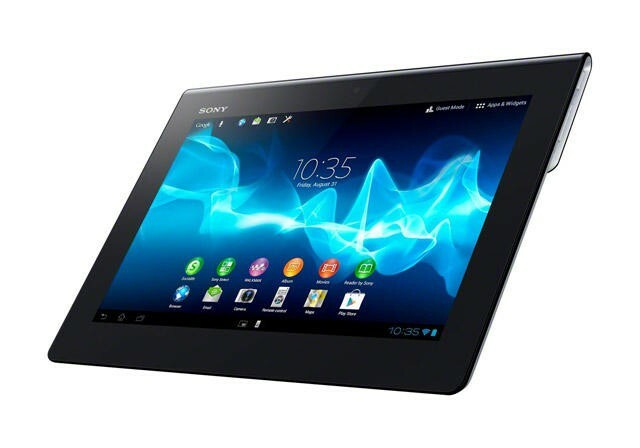 The Sony Xperia Tablet S will be available next month running on Ice Cream Sandwich (4.0.3) and powered by an NVIDIA Tegra 3 chip. The 9.4-inch tablet will come with storage options of 16, 32 and 64GB and either in Wi-Fi only or 3G models. No price has been announced as of yet. It’s the stylish, intuitive tablet you’ve been waiting for. Joining the Xperia family of mobile devices from Sony, Xperia™ Tablet S takes centre stage in your living room, connecting the family with an exciting world of entertainment experiences. The Xperia brand delivers mobile experiences that enhance user enjoyment through design, cross-device connectivity and network services. By introducing a tablet device under the Xperia brand, Sony now lets users enjoy a seamless experience between the immediate convenience of an Xperia smartphone and an immersive entertainment experience of an Xperia Tablet. Common user experience across the devices further enhances overall usability and intuitiveness. Thinner and lighter than the original Sony Tablet S, Xperia Tablet S is crafted in premium materials for effortless good looks and comfortable handling around the home or on the move. Running a speedy NVIDIA® Tegra® 3 quad-core processor and Android 4.0.3 operating system, it’s got all the power you need to enjoy your favourite media, apps and games. Splash-proof Xperia Tablet S is designed for real-life use around the home and outdoors, so there’s no need to worry about casual water spillages if you’re checking a recipe in the kitchen with wet hands. Incorporating several of Sony’s own signal processing technologies, ClearAudio+ mode lets you effortlessly enjoy audio quality that’s distinctly Sony. With one simple operation, you’ll experience sound with ultimate clarity and presence across a wide spectrum from deep lows to crisp highs. Let Xperia Tablet command your whole entertainment set-up from the comfort of a favourite couch. The infrared universal remote control is enhanced with a new Macro function that stores a time-saving sequence of commands for instant recall. Ask Xperia Tablet S to switch on your TV, cable box and home entertainment system, select inputs, adjust volume and more. Everything’s executed at a single touch, and up to six macros can be named and stored. Available for download, ‘Socialife’ is a unique application from Sony that organizes your social and information world. View, sort and manage all your SNS and news feeds through one stylish user interface, alongside your friends’ feeds and posts. Mark interesting articles for later reading when you’re not so busy. Based on what your friends are reading, Socialife also points you to other popular topics and even suggests content that you might like. Xperia Tablet is a great multi-tasker. Sony-unique ‘Small Apps’ let you do more – like changing channels or adjusting volume while you’re browsing the evening’s TV programme choices online. Add your favourite widgets to ‘Small Apps’ and make it your personal multi-tasking tool. Don’t keep all the fun to yourself: new Xperia Tablet S is made for sharing around the home. ‘Guest mode’ lets you create individual profiles for family members and visitors. Set wallpaper, icons and apps access to make the experience truly personal for everyone in the household. Xperia Tablet is your gateway to a world of entertainment experiences. Brand-new media applications combine the best of Sony’s technologies and connect to a variety of services. The ‘WALKMAN’ application automatically compiles a list of your Facebook friends’ “liked” songs, as well as related discographies. ClearAudio+ mode always ensures rich, satisfying sound – whatever you’re listening to. The ‘Album’ application lets users view, sort and share pictures and videos captured with their Xperia Tablet across an intuitive user interface. The application can also consolidate users’ photos posted on social media sites like Facebook to allow easy commenting. Video content can be enjoyed with high picture and sound quality using the ‘Movies’ application. The three easy-to-use applications also let users throw their personal picture, video content and more to enjoy on DLNA compatible large screen TVs. Store your photos and videos in the cloud for any time, any place sharing with PlayMemories Online. (Note: PlayMemories Online is available in UK, Germany and France). Through Sony Entertainment Network services, you can enjoy the latest movies, music and personal photos with a single account. Full access to millions of songs and themed radio channels at any time via Music Unlimited service (in selected countries) are available. Purchase or rent on-demand hit movies and TV shows any time you want to with Video Unlimited. Browse the exciting range of dedicated content for PlayStation® Mobile at PlayStation® Store, opening this autumn (NB: where service is available). The Reader application lets you purchase and read favourite digital books. You can also manage your bookshelf across multiple devices, including the Sony Reader eBook device and Xperia smartphone. A full range of accessories makes Xperia Tablet an even more perfect match for your lifestyle. Personalise Xperia Tablet with a choice of colourful covers, stands and docking solutions.